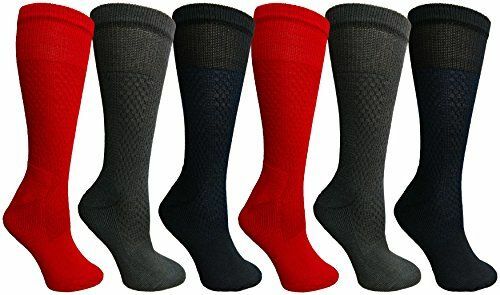 Womens Merino Wool Socks, Hiking, Camping, Lightweight Anti-Microbial Premium Wool (6 Pack) at low wholesale prices. Socksinbulk.com offers Womens Thermal Socks at bulk discounted prices. 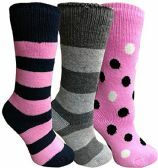 Introducing a high quality merino wool sock for ladies that is also very budget friendly. 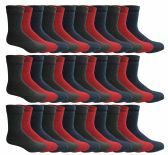 Made with 15% merino wool, these socks are great for a wide range of activities including hiking, camping, backpacking, walking, on the trail, hunting and more. For those who enjoy the great outdoors and nature, this is the perfect pair of socks for you. Featuring a smooth toe seam, terry lining, arch support and reciprocated heels, these socks are durable and made to last. They are also cushioned for comfort and for daily wear. Our merino wool socks also feature moisture wicking capabilities that will keep your feet warm and dry. Also for wear for sports, cycling, running, walking, and more. These antimicrobial socks prevent bacteria and bad odors, making it ideal for extended wear with boots or sneakers. Stay fresh while you trek, walk, or hike. These socks are great for all-season wear but is especially great for the winter as the terry lining will help keep your feet snug and warm with a premium warmth to weight ratio. No itchy feet! 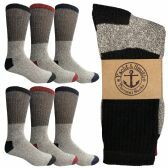 These soft knitted merino wool socks are so comfortable on your feet that they will become your go-to outdoors socks. A non-binding top offers additional comfort and is non-restrictive on the legs. Made with 15% merino wool, 42% nylon, 40% polyester, and 5% spandex. Size 9-11 will fit woman shoe sizes 5-10 (US). Buy with confidence and get a 30-DAY MONEY BACK GUARANTEE. If you are not satisfied with our socks, please contact us and we will respond within 24 hours. Your satisfaction is our top priority. For your next expedition or hike, take a pair of the ultimate all-weather and conditions socks with you. These 15% merino wool socks are thick and cushioned for maximum comfort. Featuring a smooth toe seam, terry lining, archy support, and reciprocated heels, these socks can take a beating while keeping your feet comfortable, dry, and warm. Ideal for sportswear or wearing casually. Features moisture wicking capabilities while allowing your feet to breathe making it the go-to socks for hiking, cycling, running, walking, fishing, hunting, backpacking, camping, and more. Fights off bacteria and odors while keeping your feet cool.